HAOS ART TRAIL – June 8th – 9th and 15th – 16th 2019. For full ‘Art Trail’ details, see – www.horshamartistsopenstudios.co.uk HAOS website. CONTEMPORARY ART FAIR – October 20th – 21st 2018. ARTS and CRAFTS FAIR – July 21st 2018. Kissingate, Plummers Plain RH13 6LU. Displays and Demonstrations of a variety of crafts including sculpture, textiles, glass-making and basketry. HANDMADE FAIR – July 14th and 15th 2018. 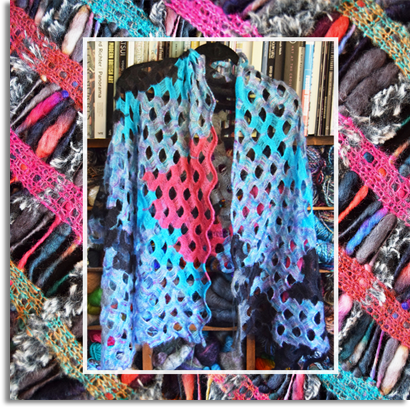 The ‘THREAD‘ Textile Exhibition – January 18th – April 23rd 2018. 9am – 5pm Monday to Friday. Iris is exhibiting as an invited artist alongside other textiles and an Embroiderer’s Guild display. Over 40 Sussex artists and makers who will be showcasing and selling their original artwork. Invited lecturer and demonstrator at regional MK Guild (USA) seminar. SAN DIEGO seminar – April 1st – 2nd 2017. ‘STITCHING IN TIME’ Exhibition – January 14th – 17th March 2017.